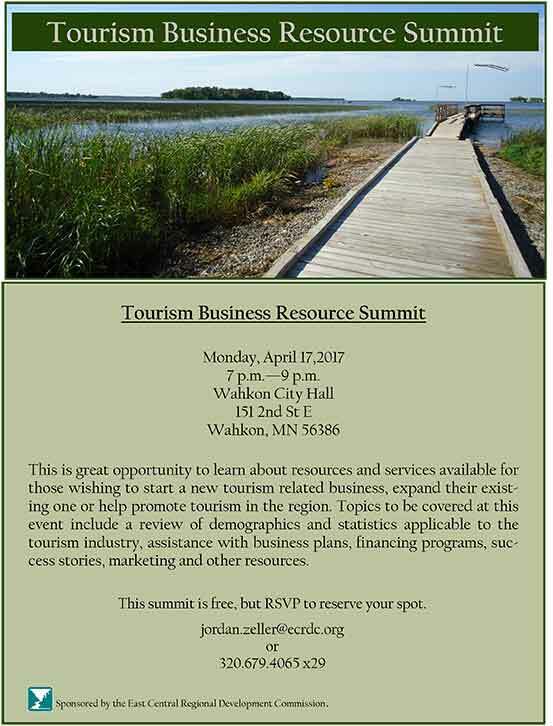 You are cordially invited to a Regional Tourism Business Resource Summit on Monday, April 17th from 7:00 – 9:00 PM at Wahkon City Hall (151 2nd Street E. – Wahkon, MN). The goal of this event is to connect Tourism, Hospitality & Retail Businesses along with would-be entrepreneurs to services and resources to help them start, strengthen or grow their business. This event will include presentations on regional tourism related demographics and statistics, assistance with business plans, marketing, financing & business loan and grant funds. We will also have presentations on resources and opportunities from Explore Minnesota Tourism and Hospitality Minnesota, as well as from industry professionals who will share their real-world successes. Please pass the attached invitational flyer along to anyone you think may be interested in attending. Any assistance you can provide in helping spread the word of this event (forwarding this email, posting on Facebook, Twitter and websites, etc.) would be greatly appreciated! I received the email below from David J. Minke, Pine County Administrator today. The county board is interested in meeting with representatives of the townships in the county and asked me to reach out to the township officers association to determine your interest in meeting and potentially set up a meeting. The commissioners are contemplating an informal Committee of the Whole format. Can you reach out to your township colleagues and let me know if you think there would be interest in such a meeting and any idea for topics. The county board conducts several meetings around the county. Below is the current schedule of locations and topics. We will likely add to the schedule over the summer as the commissioners identify topics they would like to discuss. We also reserve time at the beginning of each meeting for informal conversation with citizens and city or township officials who may attend. Feel free to share the schedule with anyone who might be interested.